Below is a copy of the text of the trademark license agreement between the MariaDB Foundation and MariaDB Corporation Ab. This Exclusive Trademark License Agreement (“Agreement”) is made by and between MariaDB Corporation Ab, a stock company formed in Finland and formerly known as SkySQL Corporation Ab (“MariaDB Corp”), and MariaDB Foundation, a non-profit corporation formed in Delaware, U.S.A. (“MDBF”), and made effective as of the date that MDBF was organized – the 30th day of April 2012 (the “Effective Date”). MariaDB Corp is the owner of all right, title and interest in the family of MariaDB trademarks, including the MariaDB text mark and the MariaDB sea lion logos (the “MDB Marks”). MDBF is a non-profit corporation whose mission is to: [a] steer and guide the continued non-profit development and promotion of new, GPLv2 releases of the MDB Server in an open and transparent fashion that meets the needs of the open source community; [b] grow a vibrant community and ecosystem for the MDB Server; [c] maintain free, open and perpetual access to the repository for the MDB Server; and [d] solicit and accept financial and code contributions in furtherance of the foregoing (the “MDBF Mission”). Pursuant to and in consideration of the terms and conditions of this Agreement, the parties confirm that MariaDB Corp has granted to MDBF (from the Effective Date) an exclusive license to use certain MDB Marks in furtherance of the MDB Mission, but reserved for MariaDB Corp all rights not expressly granted to MDBF in this Agreement, including the exclusive right to use variations of the MariaDB mark on a commercial basis. Capitalized terms not defined in the body of this Agreement shall have the meanings provided in Exhibit A. 1. Exclusive License. Subject to the terms and conditions of this Agreement, MariaDB Corp grants to MDBF a worldwide, royalty-free, exclusive license to use the following MDB Marks to further the MDB Mission: [a] “MARIADB FOUNDATION” as the corporate name of MDBF; [b] the MDB Server Mark for the purpose of identifying the MDB Server, and for promoting MDBF as the official source of the MDB Server; [c] the MDBF Mark and the MDBF Logo for the purpose of identifying and promoting MDBF and the MDBF Mission; and [d] the MDBF Domain Name for the purpose of identifying MDBF and promoting the MDB Mission. During the term of this Agreement, the MDB Server Mark shall be the sole brand used by MDBF to identity the MDB Server. 2. Right to Sublicense Membership Badges and Create Occasional or Seasonal Logos. Subject to the terms and conditions of this Agreement, MariaDB Corp grants to MDBF a worldwide, royalty-free, exclusive license to: [a] grant limited MDBF Badge Mark sublicenses to members of the open source community who provide financial or other support to MDBF, solely for the purpose of allowing those supporters to indicate that the person or entity is a then-current supporter; and [b] create occasional or seasonal variations of the MDBF Logo solely for use in accordance with Section 1[c], subject to the prior written approval of MariaDB Corp, such approval not to be unreasonably withheld or delayed. 3. Right to Assign the Agreement. Upon 30 days prior written notice, MDBF may assign this Agreement (including all rights and obligations herein) to a successor in interest, provided that such successor in interest is a non-profit entity which has adopted the MDBF Mission and agreed in writing to abide the terms and conditions of this Agreement. 4. Use of Trademark Symbols. In order to avoid confusion, the home and main web pages on any MDBF website (including MariaDB.org) and all official or formal documents (e.g., agreements) that use a Licensed Mark shall: [a] bear the symbol “®” in jurisdictions in which MariaDB Corp has obtained a registration for the applicable Licensed Mark and the use of such symbol is permitted (such as in the USA and Europe), and the symbol “™” in all other jurisdictions, in the first or most prominent mention of the Licensed Mark; and [b] include the following attribution statement “The MariaDB® mark is a trademark of MariaDB Corporation Ab. The mariadb.org, MariaDB Foundation and MariaDB Server marks are exclusively licensed to the MariaDB Foundation.” The foregoing requirement does not apply in informal contexts where such symbols and notices are not normally included (e.g., email; online discussion; source code files). 5. Mutual Cooperation. MariaDB Corp reserves any and all rights not expressly or exclusively granted to MDBF in this Agreement. Because the parties will use different versions of the “MARIADB” brand for different purposes, the parties agree to work together in good faith in order to avoid confusion among consumers or in the community between the source of authorized MDBF goods and services (such as MDB Server), and the source of MariaDB Corp’s various goods and services (such as MDB Enterprise, MariaDB Enterprise Cluster, MariaDB Consulting, MariaDB University, MariaDB Remote DBA, and MariaDB Connectors). In furtherance of this mutual cooperation, and as agreed in a letter agreement between the parties executed contemporaneously with this Agreement, the parties agree to establish a framework for a trademark code of conduct that will apply equally to all members of MDBF. 6. Dispute Resolution. The parties shall meet and confer in good faith (including by telephone) through ordinary communication channels to resolve any claims or disputes arising out of or relating to this Agreement (“Disputes”). To the extent Disputes cannot be resolved through ordinary communication channels between the parties, the CEOs of each party agree to meet and confer in good faith (including by telephone) to resolve any such Disputes. To the extent that a Dispute cannot be resolved independently by the foregoing methods, either party may submit such Dispute to mediation. The parties shall share the mediator’s fee and any filing fees equally. Disputes that are not resolved by mediation shall be exclusively decided by arbitration in accordance with the Commercial Arbitration Rules of the American Arbitration Association then in effect. The prevailing party shall be entitled to recover costs, including reasonable attorneys’ fees if permitted by law. Any arbitration demand must be made within 30 days after the conclusion of mediation. Any arbitration shall be conducted by a single arbitrator, who shall be bound by the provisions of this Agreement, base the decision on applicable law and judicial precedent, include in such decision the findings of fact and conclusions of law upon which the decision is based, and not grant any remedy or relief that a court could not grant under applicable law; such remedies and relief shall include damages and injunctive relief. Any award rendered in arbitration shall be final, and judgment may be entered upon it in accordance with applicable law in any court having jurisdiction thereof. Any mediation or arbitration requested by either party shall be held in Helsinki, Finland. 7. Governing Law. This Agreement shall be construed in accordance with the laws of Finland, without giving effect to the principles of conflicts of law thereof. 8. Term. This Agreement and the trademark license granted hereunder shall be effective as of the Effective Date, regardless of the date of execution. In the event of insolvency of MDBF, or if MDBF fails to cure a material breach of this Agreement within forty five (45) days after MariaDB Corp provides written notice specifying such breach, subject to completion of the dispute resolution processes outlined above, MariaDB Corp may then terminate this Agreement. In the event of any such termination, MariaDB Corp shall: [a] promptly grant to another non-profit corporation which has adopted the MDBF Mission all of the rights granted herein to MDBF on substantially the same terms and conditions as this Agreement, provided that such non-profit corporation agrees to such terms and conditions in writing, or [b] in the absence of such a non-profit licensee, keep the main source tree for MariaDB Server up to date and open for community developers; this obligation shall survive any termination of this Agreement. The foregoing requirement doesn’t affect any MariaDB Corp. branch or fork of the MariaDB Server (such as MariaDB Enterprise), which will continue to be distinguished (like MariaDB-xxxx) so as not to be conflicted with the community MariaDB Server. 9. Miscellaneous. In the event of a conflict between this Agreement and the letter agreement referenced in Section 5, the letter agreement shall prevail. The terms and provisions of this Agreement, including attached Exhibit A, constitute the entire agreement between the parties with respect to the matters described in this Agreement and supersede all prior agreements, negotiations, representations or proposals, whether written or oral, relating thereto. Unless otherwise specified, every use of the term “including” means “including, without limitation.” This Agreement may not be modified or amended unless set forth in a writing executed by both parties. IN WITNESS WHEREOF, the parties, being duly authorized, have executed this Agreement under seal as of this 6th day of October, 2014. “GPLv2” means version 2 of GNU General Public License. “Licensed Marks” means the MDBF Mark, the MDB Server Mark, the MDBF Logo and any and all MDBF Badge Marks. “MDB Server” means the version of the MariaDB database management system (including patches and new releases) released by MDBF under GPLv2 as a community-driven, open source database management system. The MariaDB Foundation is the entity that defines which is the official community version of the MariaDB server. “MDB Server Mark” means the “MARIADB SERVER” text mark, as pictured in this Exhibit A. “MDBF Badge Mark” means a version of the MDBF Logo created solely for use in connection with “badges” made available to those members of the open source community who provide financial or other support to MDBF. 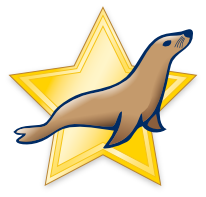 As of the execution date of this Agreement, approved MDBF Badge Marks are the “Sponsor of the MariaDB Foundation” and “MariaDB Captain (sea lion on star)” logos pictured on this Exhibit A. By the end of 2014, MDBF will replace the “sea lion” drawing now used for the MariaDB Captain logo with the “sea lion” drawing proposed by MDBF and approved by MariaDB Corp for the MDBF Logo. “MDBF Domain Name” means mariadb.org or any other non-commercial, mariadb top-level domain name approved by MariaDB Corp in writing (such as such as mariadb.nonprofit or mariadb.foundation), such approval not to be unreasonably withheld or delayed. “MDBF Logo” means a logo [a] consisting of a sea lion that does not include the colors blue or white, or a combination of blue and white, [b] together with the words “MariaDB Foundation” and [c] which has been approved by MariaDB Corp. On or before November 14, 2014, MDBF shall propose to MariaDB Corp a new MDBF Logo that is not likely to cause confusion with any sea lion logo used by MariaDB Corp. Upon MariaDB Corp approval of a suitable new MDBF Logo, MDBF shall migrate to the new MDBF Logo, and phase out all prior variations of the MDBF Logo, by January 1, 2015. “MDBF Mark” means the “MARIADB FOUNDATION” text mark, as pictured in this Exhibit A.